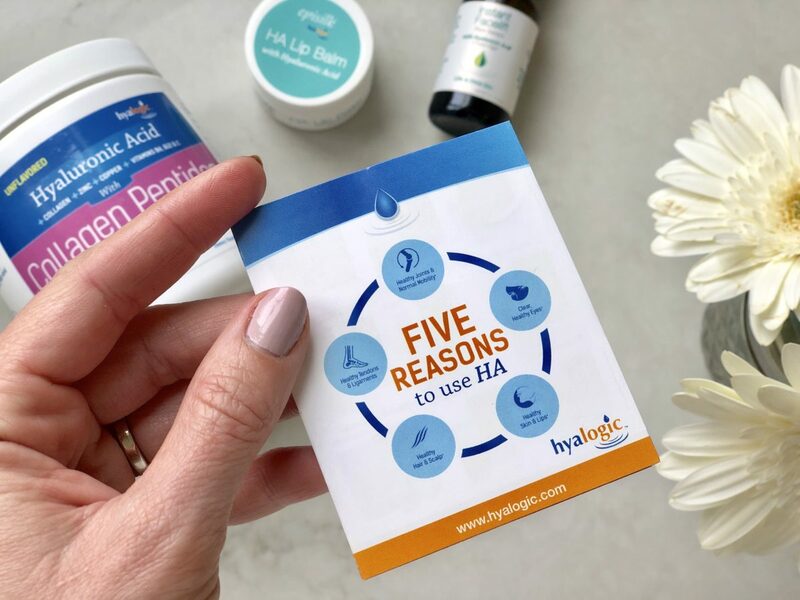 I am super excited to be partnering up with the brand Hyalogic to share with you the reasons why Hyaluronic Acid is SUCH a big deal and why everyone should incorporate HA into their skincare routines! So what exactly IS Hyaluronic Acid (or HA for short) you might be asking?? 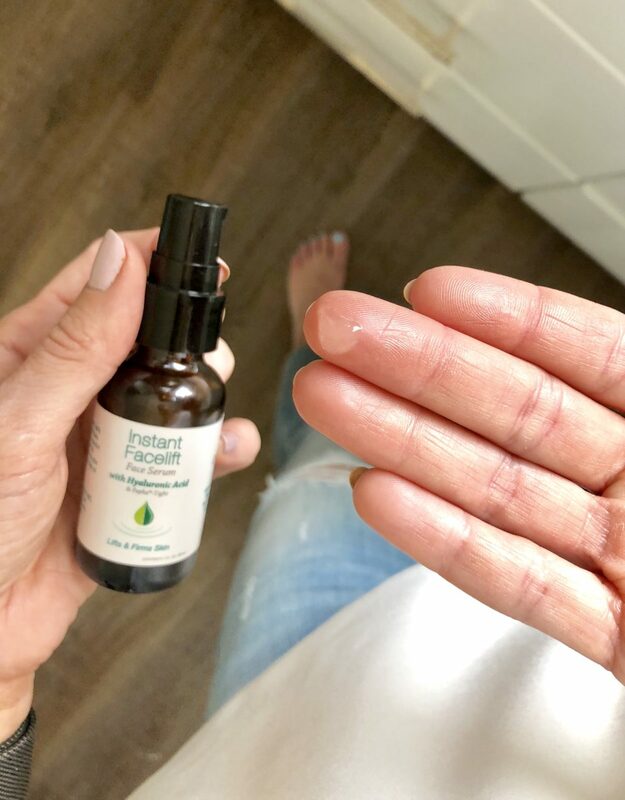 In a nutshell, Hyaluronic Acid is one of those molecules that has the magical ability to retain moisture…and lots of it. As most of us know, lack of moisture is one of the big culprits to aging skin. Therefore incorporating this ingredient into your skincare routine is a must in order to repair and protect your skin moisture barrier. 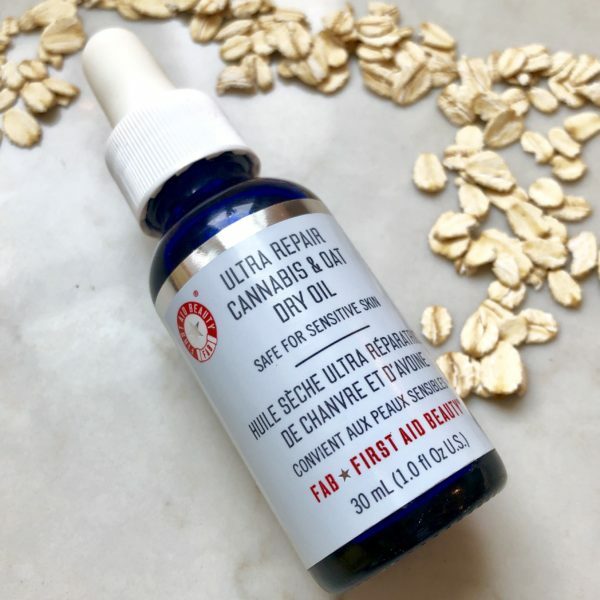 And if you’re new here, you should know that my dry skin is a major pain point and I’m always searching for ways to get rid of my tight dehydrated skin! 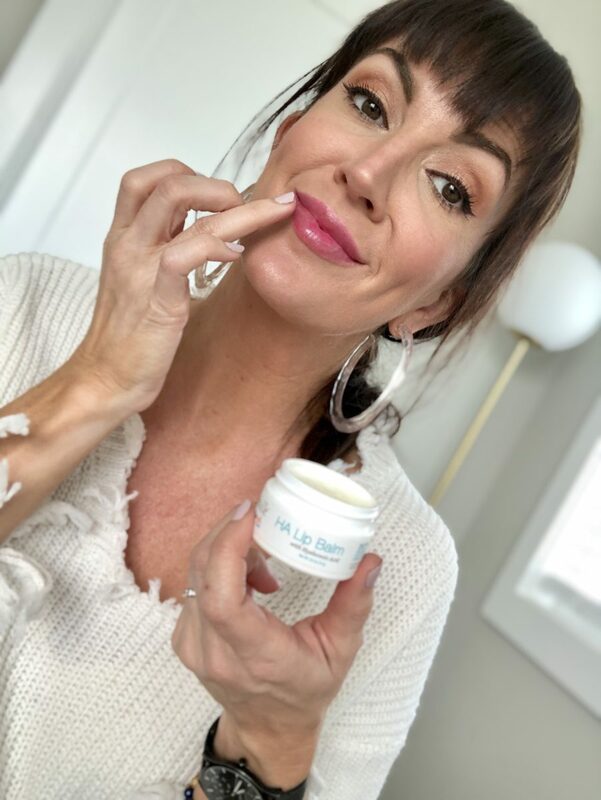 Being 40+, a makeup artist, and beauty blogger, I have done my fair share of research on what ingredients I should be looking for in my skincare products to keep myself (and my clients) looking as youthful as possible. So I have known for awhile that HA’s were an important factor when considering my moisturizers and creams. 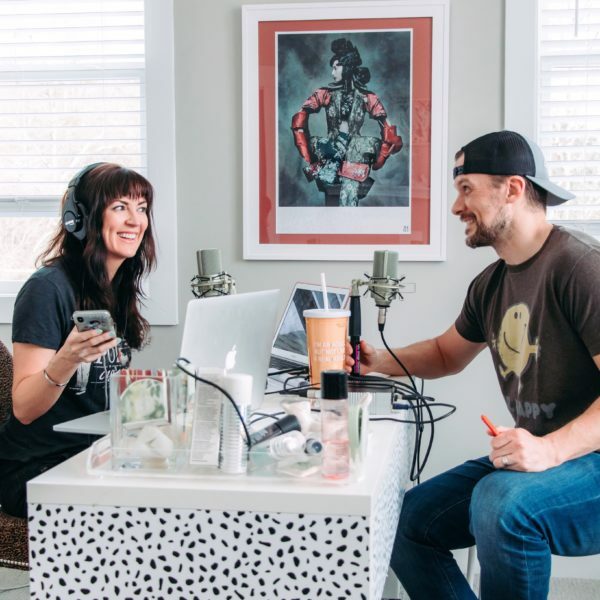 But after partnering up with Hyalogic, and finding out more about the brand and how it started, I now realize there are a multitude of ways we can all incorporate Hyaluronic Acid into our daily regimes, and it’s not just with skin creams!! 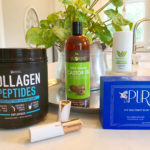 This brand offers 50 HA based products for humans and animals and was a 2018 Better Nutrition Best of Natural Beauty winner and one of the 2019 Delicious Living Beauty & Body Award-winning skincare products. Not only do they have skin benefit products, but also products helping with internal joint health and mobility. 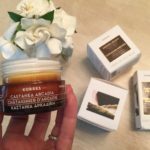 In short, the fountain of youth benefits are endless related to incorporating HA into products such as lip balms, creams, lotions, supplements, and other products. 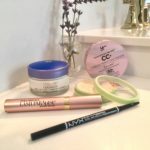 Here is a look at 3 of their 50 products I had the pleasure of using over a months time frame. 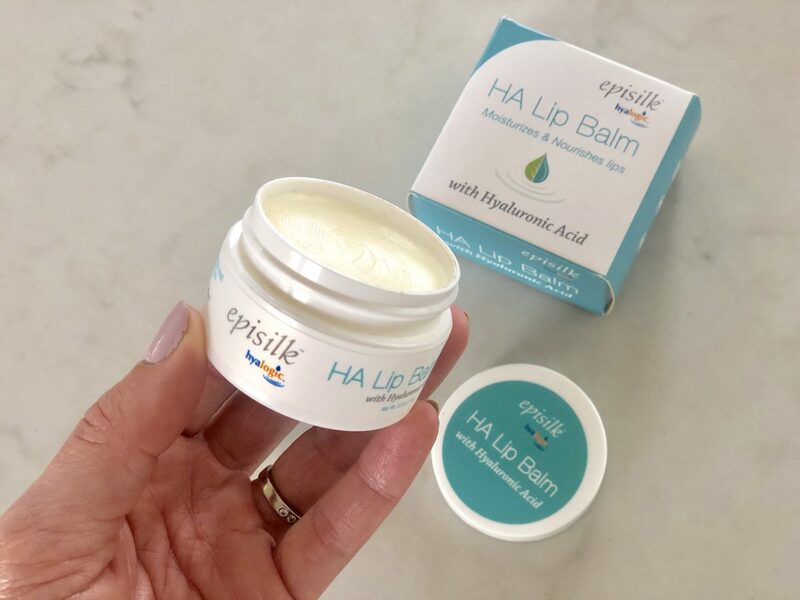 First up is this Episilk HA Lip Balm, $6.95. 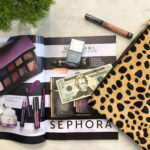 It is very lightweight, moisturizing, and doesn’t feel thick at all. It has zero fragrance and glides on so nicely. Immediately my lips absorb it and feel moisturized. How I use this : After brushing my teeth at night, I’ll take an old toothbrush, apply this to my lips and scrub it into my lips to naturally exfoliate them while also conditioning them at the same time. My kids don’t mind this lip balm either because it’s not sticky whatsoever and has no taste. So it works for the whole fam! It contains HA of course, shea butter, olive oil, cocoa butter and a few others. Next up is the Instant Facelift Serum, $29.95. Using a serum is a crucial part of my everyday skincare routine so I’m not a newbie to using serums and I love them! This one is also fragrance free, colorless, and very lightweight. It’s main goal is to support natural skin firmness while also moisturizing the skin and helping with elasticity. How I use this : After I wash my face and apply my toner, this is my next step. 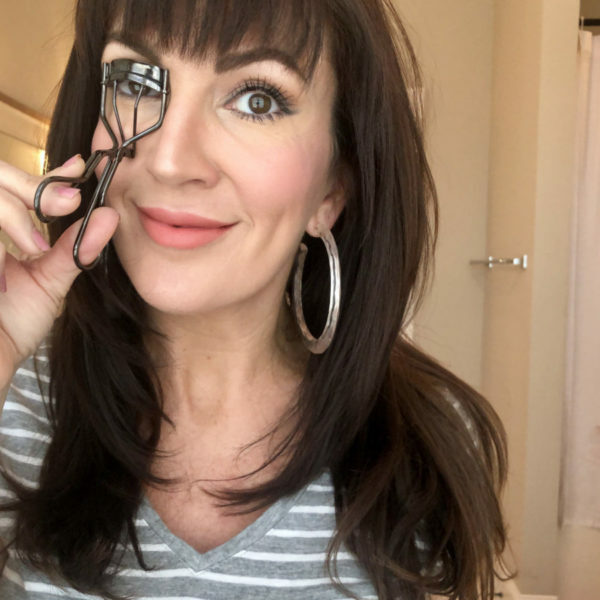 I use a few pumps of the product and add just a drop of water to it to make it light and viscose feeling then I massage it into my face using an outward and upward motion. Face massages are important ladies – don’t discount them when adding your skincare products. It will feel a bit tacky at first but once it dries completely it feels wonderfully smooth. I apply my night creams on top of this serum in the evenings but in the mornings I usually stop at the serum and apply my foundation right on top after it dries. 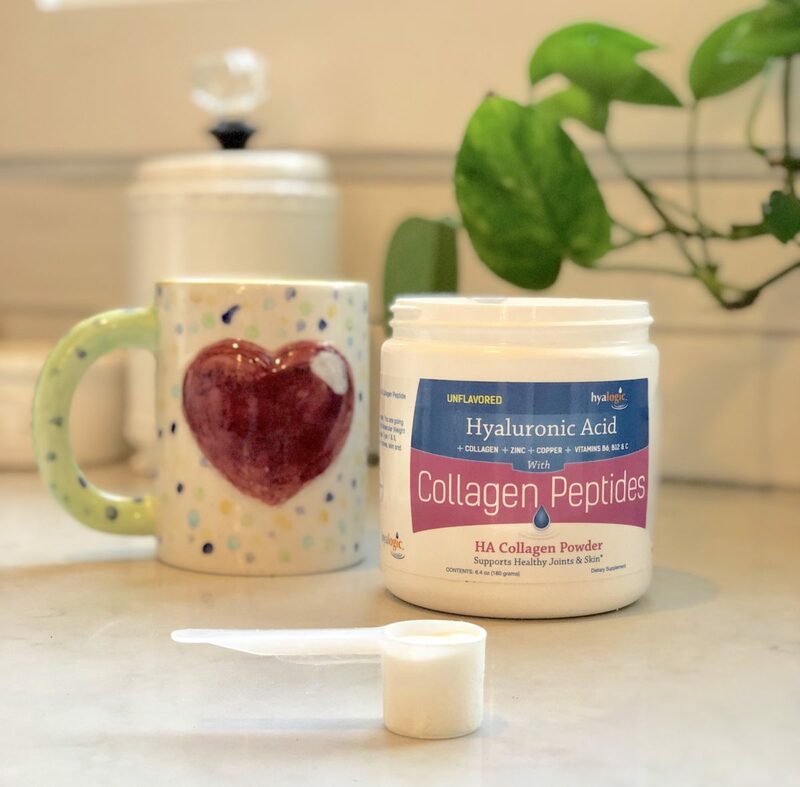 Last but certainly not least, is this HA Collagen Powder, $29.95. I am a big believer in you are what you eat (hopefully I won’t turn into a McDonalds cheeseburger tho!) and so incorporating your Hyaluronic Acid internally also makes sense in addition to topically applying them. This unflavored white powder is made to help support healthy joints, bones, skin, and nails! It’s basically good for everything. 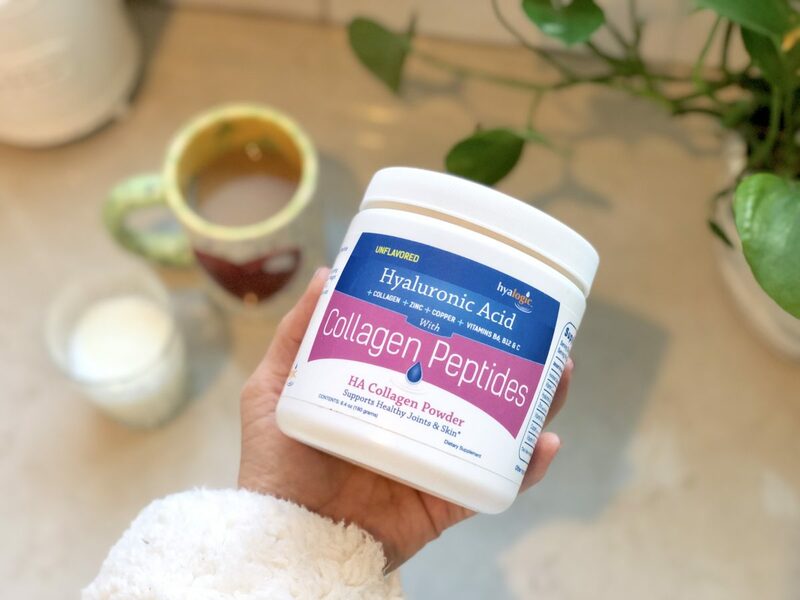 It contains other beneficial ingredients in it besides HA, like Hydrolyzed Bovine Collagen Type 1 & 3, Vitamin C, Zinc, Vitamin B6, Copper and Vitamin B12. If you have followed me on Insta stories, you have seen I have been consuming collagen powders for awhile now. I remember when I first used up an entire tub, I didn’t think I noticed a big difference in anything. Until I QUIT using it and didn’t rebuy the powder. I then started to find my nails started breaking easier and my skin just didn’t seem to be looking as great as it did after consistent use of the powder. Needless to say, I won’t quit my collagen consumption anytime soon now!! How I use it : I take one scoop everyday, usually in the mornings, and I’ll put it in my glass of milk or my hot coffee. It is a bit more difficult to absorb into colder drinks than warmer ones just FYI so you just have to do more stirring to disperse it. I find that it does not change the flavor of these two liquids of choice which is great. Hope you all enjoyed this informative skincare + beauty post! And it bears repeating, but you MUST use any new skincare product for at least 3-4 weeks (in my opinion) to see real results with consistent use. Like the old saying goes “Rome wasn’t built in a day,” right?? 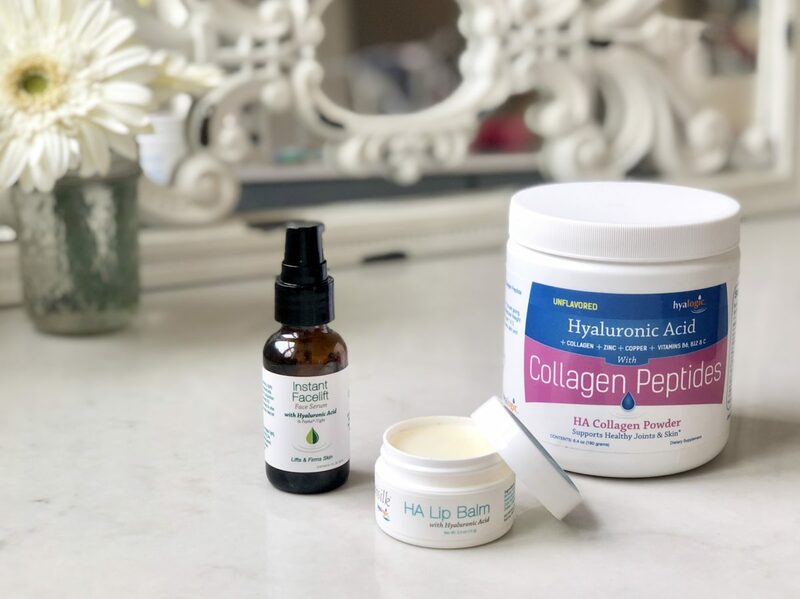 If you’re curious and want to try any of these HA products I mentioned or other Hyalogic products they offer, you can use my discount code : JSM20 for 20% off your entire order and they have free shipping over $49 purchases. How nice is that?? Special thanks to Hyalogic for sponsoring this post and for this generous percentage off for my readers. Of course all opinions and thoughts about these products are honest and my own. 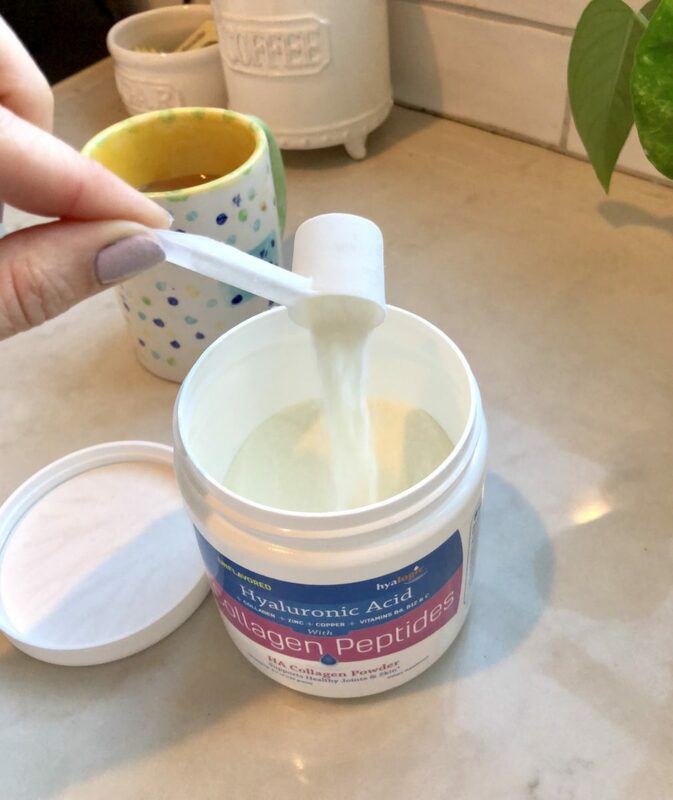 Do you use Hyaluronic Acid in your skincare routine yet?